Today, April 16th only, head over to Amazon where you can score some great deals on toys and crafts! As just one idea, you can score this Play Circle by Battat Neat Home Vacuum Set for just $17.46 (regularly $23.75). The play circle home neat home Vacuum set is a 2-in-1 pretend Vacuum for kids that makes cleaning up with mom or dad so much fun! 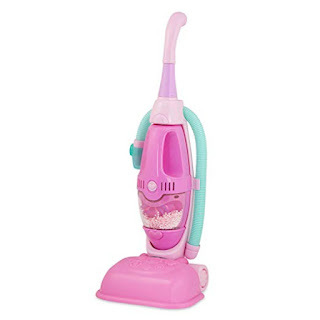 This colorful plastic vacuum cleaner converts from an upright push Vacuum to a removable hand-held "dust Buster" and has a hose and nozzle for detail work. Make the pretend-play much more REAL with realistic Vacuum sounds and whirling beads. Pop out the removable dust cup and hear the beads shake as you pretend to empty it out. This play Vacuum for toddlers helps them learn how to keep a tidy house while engaging in mirroring, learning, imaginative play, and developing fine motor skills. The size of the vacuum is perfect for small hands and the wheels let little cleaners easily push the Vacuum around. This brightly colored pretend Vacuum cleaner is fantastic gift that provides different screen-free role-play and learning opportunities at a variety of ages and developmental stages.